Do not drink juices in big amounts in one go. Spread your juice meals evenly over the day. 200 ml every two hours would be ideal. 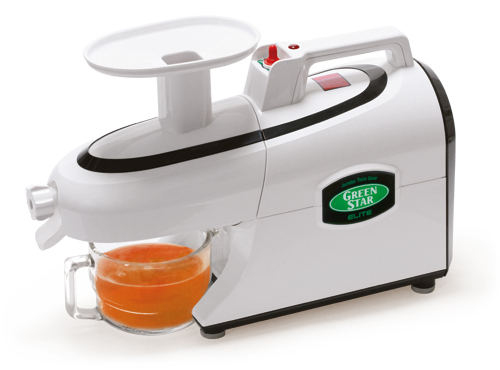 If you do not extract your juice with the Green Star Elite Juice Press or the Green Star Elite Juicer, I recommend preparing the juice freshly for each juice meal and drinking it directly after pressing; you should not store it. Juices drunk immediately after pressing contain the maximum nutritional value. The length of time a juice remains rich in content and nutrients after juice extraction depends, among other things, to a large extent on the method of extraction. Green Star™ Elite juices, for example, remain stable longer, because the juicer has magnets built into the stainless-steel augers that transmit vital forces into the juice. Juices made with the Green Star Elite Juice Press or with the Green Star Elite Juicer oxidise more slowly. For this reason you can keep these juices for up to 48 hours. Such a very practical advantage means you can extract juice for two days at one go; you can then take your juices to work with you or drink them while travelling. Protect your juices additionally by, for example, peeling off a thin layer from carrots instead of scrubbing them. Fill the container you use for storage – best here is a thermos flask – right to the brim so that there is no space left for oxygen. Also very important, keep the juice cool. Some juice connoisseurs recommend filtering the juice again after extraction in order to remove as many solid particles as possible; the argument here is that these cellular structures in particular contain remnants of harmful toxic matter and pesticides. always have the highest concentration of nutrients. To extract 100 ml of juice you need about twice the amount of fruit or vegetables, depending on the product and how fresh it is. Consume about a litre of juice a day during a juice treatment, this is the equivalent of two kilos of plant substance. Be careful if you read instructions recommending 3 litres of vegetable juice and more. Such an amount would overstrain the metabolism of most people. “Juice treatments” like this would be anything but an enhancement of digestion; they would in fact bear more resemblance to a continuation of the suicidal gluttony of our civilised world, just with other products. Juices are really meals – not just drinks! The best way to enjoy your juices it to use a dessertspoon and a flat dish, just as you would if you were eating a creamy dessert. The juice is best exploited if you chew each portion a little so that saliva flows and your digestive glands can adjust ideally to the meal that follows. Juice recipes for juicers is the benefit of health and beauty with the necessary nutrient intake.